For years, rumoors of the Marsh Girl have haunted Barkley Cove, a quiet town on the North Carolina coast. She’s barefoot and wild; unfit for polite society. So in late 1968, when handsome Chase Andrews is found dead, the locals immediately suspect Kya Clark.But Kya is not what they say. Abandoned at age ten, she has survived on her own in the marsh that she calls home. A born naturalist with just one day of school, she takes life lessons from the land, learning from the false signals of fireflies the real way of this world. But while she could have lived in solitude forever, the time comes when she yearns to be touched and loved. 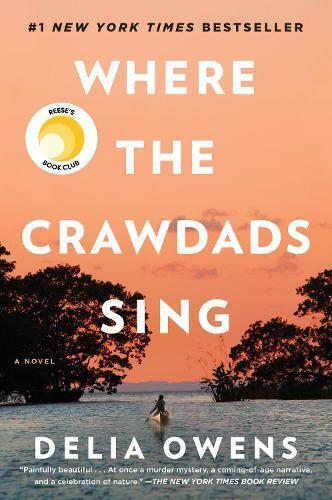 Drawn to two young men from town, who are each intrigued by her wild beauty, Kya opens herself to a new and startling world–until the unthinkable happens.In Where the Crawdads Sing, Owens juxtaposes an exquisite ode to the natural world against a heartbreaking coming of age story and a surprising murder investigation. Thought-provoking, wise, and deeply moving, Owens’s debut novel reminds us that we are forever shaped by the children we once were, and that we are all subject to the beautiful and violent secrets that nature keeps.